Media Credit: Photo by David Kilper, courtesy of Washington University in St. Louis. Igor Efimov (right) will serve as the University's new biomedical engineering department’s chair this January. Efimov currently works at Washington University in St. Louis, where he researches solutions for cardiovascular problems, including creating small defibrillators that can be implanted in patients. Igor Efimov had been offered a department chair position before, but it was never the kind of opportunity he had sought out. But when Efimov comes to GW in January to serve as the new biomedical engineering department’s first chair, he will have a unique opportunity to build a program from the ground up, completely centered around his own vision. The University’s newest department launched this fall, but professors spent the semester addressing administrative issues, including changing the names of courses to reflect the program’s separation from the electrical engineering department. Now that the department has a leader, Efimov said it will start on a path to becoming one of the best in the country. He said he plans to capitalize on GW’s location and create a master’s program that will help students land jobs at top government agencies like the National Institutes of Health and the Food and Drug Administration. Many government organizations need help regulating medical devices, he said, including ones that biomedical engineers invent. Biomedical engineers aim to bring engineering and medicine together to improve health care. “We can provide a balanced curriculum in collaboration with officers from those institutions who have expressed a strong interest in it,” he said. His place at GW is an endowed chair, funded by a $1 million donation from University Trustee Terry Collins and his wife, Alisann. 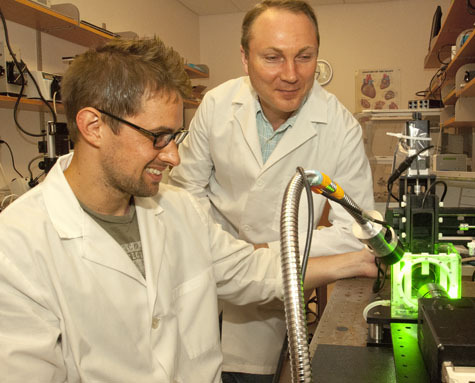 Efimov now works at Washington University at St. Louis and focuses his research on developing solutions for cardiovascular issues, including creating small defibrillators that can be implanted in patients and help regulate heart rates. He will bring his graduate students and one post-doctoral student who will have a visiting faculty appointment at GW. Efimov added that he hopes to eventually lead a department made up of 15 faculty members, which would mean increasing the size of the department by more than twice its original size over the next decade. He said he hopes to hire both senior and junior faculty members and put in place a mentorship program, in which more experienced professors can teach their younger counterparts skills like writing grants and setting up labs. He said he was most impressed by the University’s commitment to improving its science and engineering programs, including building the $275 million Science and Engineering Hall where his lab will be housed. Matthew Kay, a GW professor who has collaborated with Efimov in the past, said the search committee recognized Efimov’s vision for the department and his ability to collaborate with researchers from across the globe. He said Efimov had reached out to GW as soon as the position was announced and stood out to faculty with his plans to increase research within the department and develop programs that play to GW’s strengths, including the regulatory medical device program. Kay said having a permanent chair in place will be critical to the success of the department, which he said can encourage collaboration among members of the School of Engineering and Applied Science and the School of Medicine and Health Sciences. Researchers from both schools could develop cutting-edge projects like imaging devices, prosthetics and pacemakers. Murray Loew, a professor in the department and director of the former biomedical engineering program, said Efimov’s appointment will bring attention to what he called a previously overlooked area. He said biomedical engineering students are happy to be part of their own department and not held to the standards of the electrical and computer engineering department, where they were previously housed. He added that the physical proximity to the medical school means GW is perfectly positioned to rise to the top of a thriving field.